A black and white portrait photograph of Mrs. John Dryden (Mary Lydia Holman) (1845-1928). This photo was taken in New York City, about the time of her marriage. 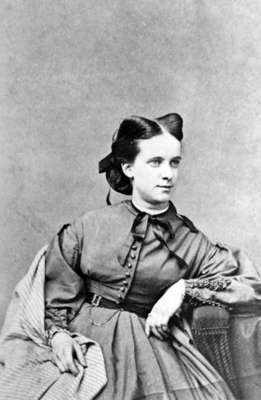 Mrs. John Dryden (Mary Lydia Holman) was born in New York City, New York, United States of America (U.S.A.) on January 23, 1845, youngest daughter of Thomas Holman. She and John Dryden of Brooklin, Ontario were married at New York City on February 13, 1867. John Dryden later became Ontario's Minister of Agriculture from 1890 to 1905. Mary died at Toronto on September 28, 1928 and was buried at the Dryden Baptist Cemetery, Whitby Township.